I fished an afternoon trip today in an effort to time the trip with the presence of a favorable wind. After a fairly windless morning, a sustained breeze from the south began to blow at 8-12 mph by around 2pm. I got out on the water at 2:30p and did well. Air Temp: 29F at sunrise heating up to 67F by afternoon. Wind: Winds were light and variable until around 2:00p, and then took on a due S course at about 8-12 mph. I checked only 3 areas today and found fish at 2 of them. Birds were an indicator at all 3 areas, and terns were more telling than the gulls. My first stop came at the end of a deep flat as it rolls into the channel in 38-41 feet (Area 340). There were 4 gulls rafted over this area and they were reluctant to leave when I approached in the boat. I ran sonar over this area a saw some good returns both on bottom and suspended up 2-3 feet off bottom. I dropped a slab down and worked over an area ~35 yards in diameter and drew no attention and moved before long. My next stop was made under active, albeit scattered, terns at Area 350. These terns were working parallel to the channel and over an area ~120 yards in length and 40 yards in width. 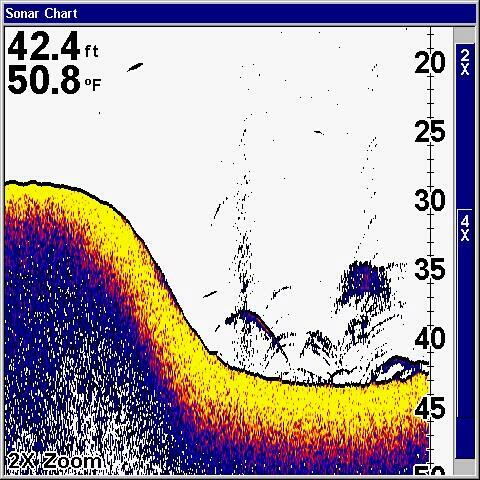 As I crept in with sonar, it revealed a lot of scattered, suspended fish and bait from 10 feet deep all the way to bottom in 41-43 feet. I baited up with a live shad on a downline set 4 cranks off bottom, and began to work with a 3/8 oz. white TNT 180. I spent about 90 minutes here for a total catch of 19 fish. Of these, 4 were barely keeper largemouth, along with 1 drum and 14 keeper whites with none exceeding 13″. Only 1 of these 19 fish came off bottom; all others were caught via a smoking technique, mostly at a depth of 15 feet or deeper. About 50 minutes prior to sunset this bite quieted down, no fish were seen suspended any longer, and no birds continued patrolling. I left and headed to Area 351 after seeing 3 flocks of terns working over loons, with a few working over fish. As I looked things over with sonar, I found a 2-tier drop with one step at 35 feet and another at 41 feet with the deeper step dropping into the channel (see photo above). On 3 passes I found fish from the top to the bottom of the first step and so stopped to work them over with a slab. From start to finish at about 30 minutes after sunset, I put an additional 16 fish in the boat including 13 white bass, 1 crappie, and 2 largemouth (1 short, 1 legal). After sunset, the fish would not pursue a smoked slab and so I switched over to a small Jigger Shad and held it right on their noses, and got them to hit that. I got 3 fish on the Jigger Shad with 2 more missed. All fish caught here were suspended fish. I fished a short half day morning “Kids Fish, Too!” trip today with Jaylen G. of Killeen. Jaylen is a bright, cheerful 9 year old 4th Grader and was a lot of fun to spend time with today. Jaylen had never fished with spinning gear before, nor had he ever been on a boat, so we had a bit of a learning curve to get through before we could worry about catching fish, but, in the end we did just that. Air Temp: 27F at sunrise heating up to only 46F by trips end and up to 53F for the high. Wind: Winds were light and variable until around 10:30, and then took on a NE course at about 6mph. When we first launched, the sun had just risen and a thin veil of fog was over the surface, but quickly lifted. We found some terns working in several areas, but they were on either shad or loons and were not indicative of gamefish. We decided to give Area 243/186 a try until the wind began pushing and the fish got active. We put out 2 downlines with live shad and we also vertical jigged. We almost immediately got hit on the shad rod with a small gizzard on it and boated a short largemouth. We stayed in this same general area all morning and found fairly reluctant fish on bottom and suspended at 30 feet or deeper over a bottom in 38 to 43 feet of water. We managed 2 more whites and 1 more barely keeper largemouth through around 10:30 when, finally, the wind kicked in. From 10:30 to 11:30 we landed the majority of our fish, 1 keeper largemouth and 10 keeper white bass, all on the 3/8 oz. TNT 180 slab in white. Although we saw many suspended fish (and witnessed many of these follow a smoked slab with some actually striking), most of the fish we actually caught came off the bottom. By 11:30 things got quiet again — the birds lit on the surface and the winds calmed back down. In all, we did about as well as I expected for the conditions we faced and Jaylen’s experience level. I fished another half day morning trip today with Garland W., a retired architect from the Tyler, TX, area. Garland is a seasoned fisherman with both fresh- and salt-water experience, however, most of his freshwater experience was with largemouth on the shallow, cover-filled lakes of East Texas. Garland hoped to experience the deep water fishery on our clear local lakes here. Air Temp: 50F at (obscured) sunrise heating up to only 52F for the high. Wind: Winds were damp and from the ESE for the majority of the trip, ranging from 6 to 11 mph. Skies: Skies were heavily fogged the entire trip. Well, it doesn’t happen often, but we got spanked today. I told Garland at the close of the trip that if I’d known the weather was going to be as we experienced, I would have cancelled the trip. The forecast was for a chance of light, patchy fog in the early morning with winds from the SE at 10-15. Instead we had a wet, drizzly, ESE wind and thick fog all morning. These conditions make for predictably poor fishing. The birds that can be so helpful this time of year do not feed in the fog (as they are sight-feeders), and although we stayed on fish, these fish were very lethargic. We began the day in the Area 54 complex and drifted with live shad waiting on the skies to clear and the birds to work. We missed a nice black bass, and managed a barely keeper black and a nice white bass for the effort and moved on. Another drift to the SW of Area 100 netted the best black of the trip, just shy of 3 pounds, and another short black. We then looked over all the humps and drops in the Area 54 complex, saw little, and moved onto Area 342 where we used a smoking retrieve for another short largemouth. We then took a short hop over to Area 349 and found the single best concentration of fish we found all day. We stayed here about 90 minutes which was as long as the fish were active. We boated 1 largemouth and 7 white bass here, and both missed several fish on the slabs and at least 3 more on live shad. Once this action ended around 11am, we found very little else the rest of the day — just one short largemouth missed at boatside at Area 340. January and February trips are always so tightly related to weather, and we just zigged when we should have zagged on this one. I fished a half day morning trip today with Garland W., a retired architect from the Tyler, TX, area. Garland is a seasoned fisherman with both fresh- and salt-water experience, however, most of his freshwater experience was with largemouth on the shallow, cover-filled lakes of East Texas. Garland hoped to experience the deepwater fishery on our clear local lakes here. The fact that he had the ability to detect a light bite and react with a good hookset helped greatly. Air Temp: 43F at sunrise heating up to 78 by afternoon. Skies: Skies were high, bright and clear. We launched prior to sunrise and kept a sharp eye out for bird activity pointing to active fish but found little. The area of the lake we were on had abundant, small schools of threadfin shad about 2″ in length over much of the surface. The birds were working over these shad which were not driven by gamefish. By around 8:15a the nearly calm winds began to pick up from the SE, and the fish responded, albeit weakly. We managed one average white bass on a smoked slab at Area 150 and then moved about a 1/2 mile to the SE where the wind was moving the water to a greater degree. At Area 346, we enjoyed an hour plus of solid vertical jigging action. Fish were still a little sluggish. Occasionally, schoolmates would rise off the bottom alongside hooked fish, but it was pretty much a one-fish-at-a-time situation. We put 19 fish in the boat here including 3 short hybrid, 2 largemouth, and 14 white bass, of which all but 2 were legal. By around 10a, the wind very suddenly increase and shifted to the SW and the fish put on the feedbag. We noted a sharp increase in activity here, and quickly put 19 additional white bass in the boat here and then experience a slowing of the wind. The fishing also slowed. We noted some minor bird activity at Area 344, drove to it and found scattered, bottom oriented white bass here. We boated 1 by slabbing and 1 by downrigging and then moved to yet another area of concentrated bird activity. This area is bounded to the N and S by Areas 347 and 348. We arrived, ran sonar, found white bass on the bottom and began jigging and picked up 6 whites right off the bat. Then we began to see hybrids on the bottom and at 24 and 35 feet in consistent bands. This demanded a downrigging approach, and that’s what we gave them. We spread a White Willow Spoon on the bottom and a crankbait up high, and in under an hour’s time put 12 legal hybrid and 6 more white bass in the boat. By 1:30p the action had played out and we called it a day. I fished a partial morning trip today in advance of a booking this coming Thursday. With the recent boat show and a trip last week specifically requested on Stillhouse, it’s been a while since I’ve been on Belton. Air Temp: 35F at sunrise heating up to 58 by afternoon. Today’s trip was taken with the accompaniment of D’Shawn G. of Killeen. He’s been staying with my wife and I as his mom is in the hospital with heart problems. D’Shawn had only fished a few times in his life up to now. Today he learned to use a spinning reel, and to vertical jig. For his efforts, he caught 7 fish unassisted (which was 3 more than on any other trip he’d ever been on), and he caught the largest fish he’s ever caught. Upon launching this morning we found ample bird activity stetching over a vast area from Area 134 all the way to Area 187, however, these birds were sipping shad and were not on top of concentrated fish. To escape the hard wind and continue the search for fish, we headed to Area 211. Sonar revealed plenty of fish, all tight to bottom in 26 to 34 feet of water, and fewer fish beyond that depth out to 45 feet or so. Fish were in tight, distinct groups and it was necessary to buoy on top of the groups, jig for them, catch until they quit, then move a few yards and repeat the process. These fish were tight lipped and would not move horizontally or vertically to chase a bait. All action came in the vicinity of Areas 211 and 327. Over the 2 hours of actual fishing time we had before the wind sent us packing, we managed 28 fish, all on the new 3/8 oz. TNT slab. Of these fish 2 were keeper largemouth, 24 were white bass from 8 to 12.5 inches, and 2 were short hybrid stripers. We left at 10a when the wind blew too hard to stay in the open water areas we found the fish at. We fished a full day trip today with Glenn W. and Kevin M. of Buchanan Dam, TX. These fellows are bass tournament partners and desired to gain confidence in deepwater fishing and the use of electronics prior to their forthcoming Fishers of Men tournament at the end of the month. Prior to this trip the pair had attempted fishing Stillhouse twice with poor results. Air Temp: 34F at sunrise (obscured by clouds), rising only to 43F by mid afternoon. Skies: Skies were cloudy and grey all day with few breaks. The direct sun shone for only minutes all day. We planned to fish a bit of shallow wood cover early on and then spend the majority of the day in deep, clear water. Our shallow water results were nil, with only one good hookup by Glenn on a jig and pig resulting in a lost fish. We fished Areas 318, 317, and the bend at 262, with Area 317 giving up the one lost largemouth. We headed onto the main lake before 9am and began to sight small groups of terns working over open water. We enjoyed success at 3 distinct locations, including Areas 340, 341, and 69. These areas held white bass with occasional largemouth, drum, and crappie in the mix. As fate would have it, despite catching largemouth regularly mixed in with white bass all through the cold months leading up to this trip, today we boated 22 fish before landing our first largemouth, which was atypical. By the time we broke for lunch around 1pm, we’d taken 53 fish from these areas. After lunch, we attempted some Carolina rigging at Areas 343 and 888. We didn’t catch any fish via this approach — I suspect that these shallower areas hadn’t warmed enough to draw fish up into the mid-depths, as no shad were seen flicking, no birds were working over these areas, and no herons were wading in these areas. We returned to deepwater fishing and hit two areas, Area 342 and 131. By trip’s end we’d boated 77 fish, 6 of which were largemouth bass, and 4 of which were of keeper size. This black to white ratio was a little lower than typically experienced over the past weeks, but these friends left the water confident that they could make a go of it on tournament day, and confident they could catch fish in deepwater, aided by sonar. The Central Texas Boat show cranks up again this weekend. As a part of the Lamiglas Pro Staff, I’ll have a full complement of 30 different Lamiglas rods aimed at bass, whites, hybrid and striper. I’ll have a free Lamiglas logo hat in the color of your choice for the first 5 rod buyers. The first customer goes home with a pickup window sized Lamiglas logo decal. I’ll also have some “pre-owned” rods and reels at bargain prices which are outside of the pro-staff arrangements I’m now working under, so I’m looking to move them down the road. Bryon Nolan has sent some nice samples of his TNT slabs as well as cards and brochures for you to look at. I’ll also have the Hazy Eye Shad tandem rigs available. If you’ve followed my blog entries you’ll know we catch a lot of doubles on this tangle-free rig. All this, and, of course you may book a trip any time — hope to see you there!! We’ll be there Fri. and Sat. only.